There are a lot of engineers in a Formula One team. The vast majority of them works at the factory. Their job is to conceive, design and constantly optimise the chassis and the Power Unit. 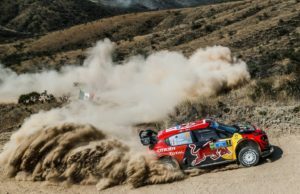 The aim – to make sure the car is both reliable and fast. 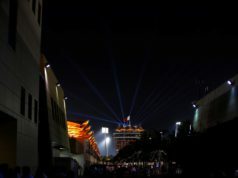 The limited number of engineers who come to the race track are responsible for extracting the maximum of performance from the car on any given race weekend. In other words – a race is won at the track, but a championship is won in the factory. Mercedes is taking a look at the engineers at the track and explains their roles. How many engineers come to the race track? About 15 to 20. As with every role in the team, the people who come to the race track are only the tip of the iceberg. At the track, the engineers work in different locations. They all come together in one room for the engineering meetings before and after each session. But some are based in the garage and others on the pit wall during the sessions. Who sits on the pit wall? Generally speaking, the engineers who have responsibility for both cars sit on the pit wall. The engineers that are based in the garage mostly look after either car 44 or 77. There are five people on our pit wall. 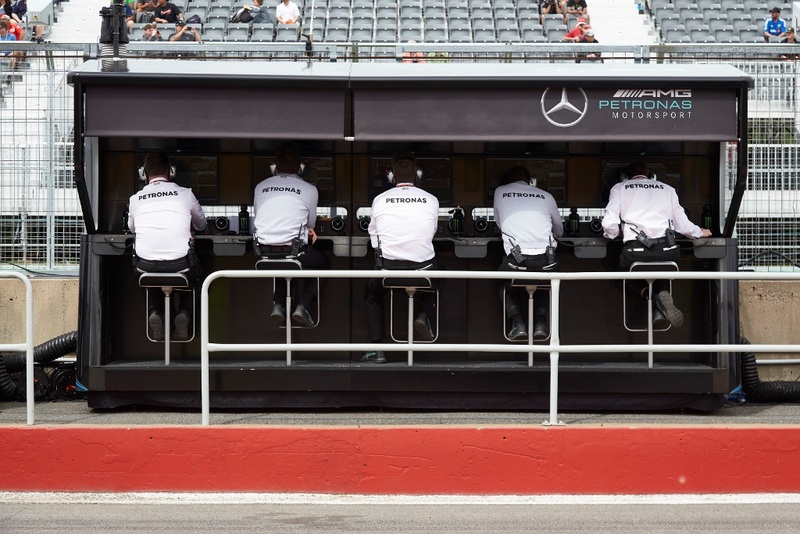 Ron Meadows, the team’s Sporting Director, sits on the left-hand side on the pit wall. His role is to make sure the team always operates in compliance with the FIA Sporting Regulations. If there is an issue, he will be the person talking to FIA Formula One Race Director Charlie Whiting. Ron also works with Chief Strategist James Vowles on the pit stops; he calls the crew out and makes sure the right tyres are being prepared for the stop. Andrew Shovlin, Trackside Engineering Director, sits to Ron’s right on the pit wall. Andrew’s role is to extract the most performance out of both cars on any given weekend. 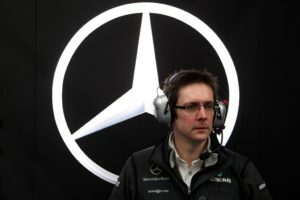 He works very closely with the engineering teams on both sides of the garage and the performance groups back in the factory to ensure that both cars benefit from the best available information. 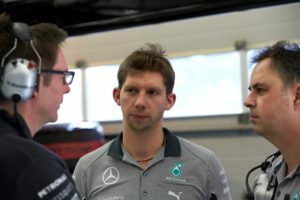 If, for example, Lewis’ engineers find a set-up improvement, the team will use this to improve Valtteri’s car as well – and vice versa. 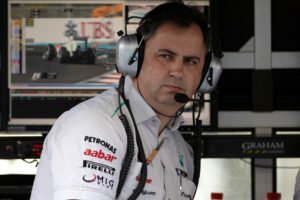 As Technical Director he’s in charge of the overall technical operation both at the track and at the factory which is why he does not attend every race. When he’s not at the race track, his seat is usually taken by a second member of the strategy team. Next to James Allison on the pit wall is James Vowles, our Chief Strategist. 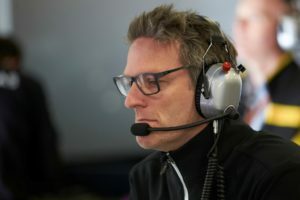 Together with a group of strategists in the Race Support Room (RSR) in Brackley, he develops the strategy that promises the best result for the team. James has the final decision on the strategy and makes the call on when to pit the cars and what tyres to use. 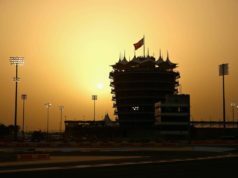 He looks after the reliability of both cars and is the first point of contact for the FIA at the track for any matters pertaining to compliance with the Technical Regulations. While many people in the garage and back in the RSR monitor different systems to see if everything is running correctly, it is Simon’s job to make the call whether we have to pit or stop the car for reliability reasons. He is also in contact with the race engineers and will inform them if he wants the driver to adapt his driving style to make sure a component does not reach critical condition, for example if we are critical on brake wear or specific temperature thresholds. Who is based at the engineering station in the garage? Next to Toto on either side of the garage are the two race engineers. They are Peter Bonnington on Lewis’ side, Tony Ross on Valtteri’s side. They stand next to the two performance engineers – Riccardo Musconi for car 44 and Marcus Dudley for car 77. Next to the performance engineers, there’s an aerodynamicist on Valtteri’s side and a tyre engineer on Lewis’ side in the garage. Both the representative from the aero department and the tyre engineer are responsible for both cars. The last workspace on the engineering station is usually used by the respective Number One mechanics of each car. What are the roles of the engineers who only work on one car? Generally speaking, there are five key engineers for each car – the race engineer, the performance engineer, the controls engineer, the engine performance engineer and the engine systems engineer. The job of the race engineer is to act as the link between the Team and the Driver. The race engineer is the single point of contact for the driver whenever he is in the car– he’s like a second set of eyes and ears for the driver and will inform him about the situation on track. What lap times are the others doing? Is there any traffic coming up? Are there hazards on the track? The race engineer is also the main point of contact for all of the factory to learn about the driver feedback from the car. The race engineer does everything in his power to deliver maximum performance to his driver and to ensure a smoothly executed, successful race weekend. The race engineer takes responsibility of managing front of house. He is making sure that the car and programme are properly managed. The performance engineer is a little more in the bowels of the car, poring over telemetry and simulations, offering the driver advice on how to squeeze the last milliseconds from the car. He will also look at particular performance subsystems such as the differential (the amount of torque transfer between the rear wheels) or the brake balance. Based on the car data he will give feedback to the race engineer who will inform the driver of a setting that promises to be faster, for example by changing the brake balance for a specific corner. The role of the controls engineer is to focus on the controls of the car, for example, the electronic controls of the gearbox with the different gear shift patterns. He will make sure the settings are correct and will deliver the maximum of performance without posing a threat to the reliability of the car. The most visible part of the controls engineer’s job is to manage all of the preparation for the race starts. Although their influence on the car is widespread and lasts through the entire weekend, this part of their role is so important and so specialised it is sometimes tempting to think of them as the kicker on an American football team – brought on to the field at a crucial moment to perform an absolutely vital role for the team. The engine performance engineer works to maximise the performance of the Power Unit. The engine systems engineer looks after the reliability of the PU. If they spot a way to get more performance or see a potential failure, the race engineer will talk to the driver to change the Power Unit settings. Anyone who watches the sport will have heard the teams talking about engine modes. That is a measure of how hard the PU is being stretched. Among many other things, it is the PU engineering team that ensures that the mode usage is optimised through the weekend to bring the best possible combination of performance and reliability. Those radio messages will start with “ HPP switch”. HPP is the abbreviation of Mercedes-AMG High Performance Powertrains, the team’s engine factory in Brixworth. 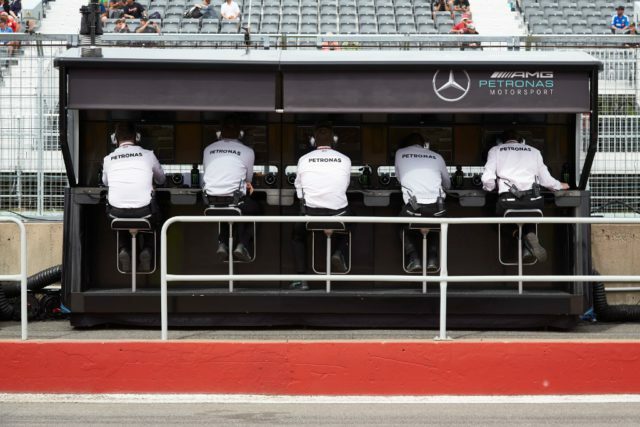 Why do the race engineers sit in the garage? Once upon a time, the race engineers used to sit on the pit wall as well. Today, however, they sit in the garage. Working from inside garage has certain advantages. It brings everybody closer together and makes it easier to have a face-to-face conversation. It’s also quieter and the race engineers don’t have to cross the pit lane when they want to come back into the garage. When the driver is in the garage during the practice sessions, the engineers can talk to him off the radio. Being in the garage also means that the engineers can see what tyre sets are prepared for the pit stop and can correct a tyre choice if they spot a mistake.